I am a U.S. history teacher and an avid reader of your blog, and I have a question which you might want to address (again) in your blog. I came across a story saying that we were coming out of "our worst recession since the 1930s." This strikes me as curious, considering our unemployment levels are not as high as the 1982 recession, I don't think. By your reckoning, assuming the worst has passed, has this been the worst since the 1930s? That raises a bigger issue:what standard should one use to "judge" a recession? There is no right answer to this question, as various macro variables reflect economic conditions, and they do not move perfectly in lockstep. But a very standard metric is the peak-to-trough decline in real GDP. 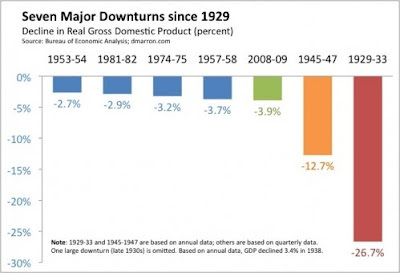 The chart above, from Donald Marron, shows that by this measure, the current recession is the worst since the Great Depression, as as long as you exclude the return to trend after the World War II boom. Note that the phrase the worst since the Great Depression may inadvertently lead the reader to think that we are somehow getting close to the Great Depression in severity. As the chart shows, that is not at all the case. One might wonder why the unemployment rate was higher in the 1982 downturn if that recession had a smaller decline in GDP. Part of the answer is that the 1982 recession followed closely after the 1980 recession, from which the economy had not fully recovered when the next downturn began. I believe that a large part of the answer is the aging of the workforce. Unemployment rates are much higher among younger workers, so it takes a much larger downturn today than it did in 1982 to generate the same unemployment rate. For example, the August 2009 unemployment rate was 9.7, while the rate was 10.8 in December of 1982 - the worst year of that recession. However, if you take the age-specific unemployment rates for persons age 16-19, 20-24, 25-34, 35-44, 45-54, and 55+ in August '09 and take a weighted average, weighting by these groups' labor force shares in December of 1982, your new "simulated" August 2009 unemployment rate is 10.9. In other words, if the age distribution of our labor force today looked like the age of the labor force in 1982, but we still had our current age-specific unemployment rates, overall unemployment would be worse now than in 1982. Obviously, this assumes that the age distribution of the labor force does not affect age-specific unemployment rates (not true! ), but it's a nice way to show that this is an important factor. The U.S. also incarcerates many more persons today than it did back in 1982 (1 in 100 according to a famous Pew estimate). Many of these persons would be unemployed if they weren't behind bars.